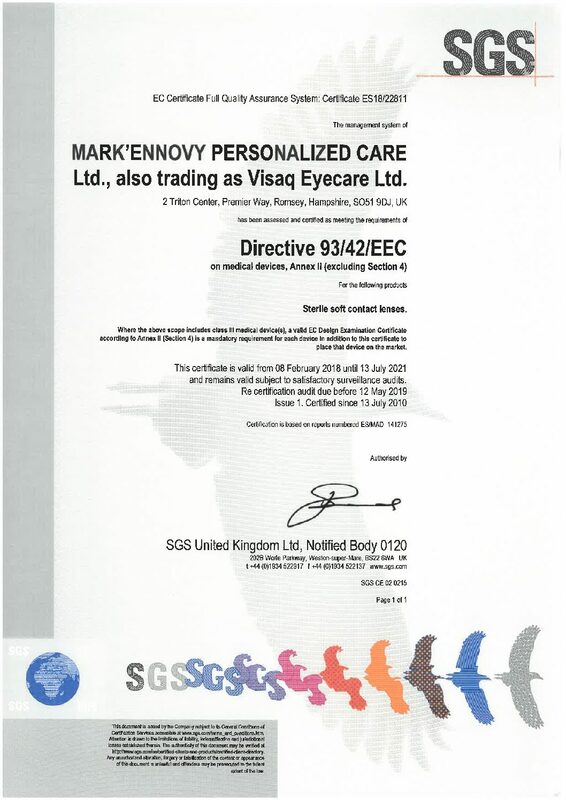 mark’ennovy Personalized Care designs, manufactures and markets a comprehensive range of soft Contact Lenses that are safe and of Premium Quality. mark’ennovy’s Vision is Transforming People’s Lives through quality eye-care and vision enhancements. Our employees are focused on Customer Satisfaction, Cost efficiencies and Compliance using measurable indicators to demonstrate these commitments and the continuous improvement and effectiveness of the documented quality management system in meeting our business objectives. 1. Our Quality Management System meets the legal requirements (*). 2. We strive to understand and satisfy the needs and expectations of our customers, and to establish our plans, strategies and objectives in line with those needs. 3. We focus on effective communication, excellence and innovation. 4. We promote a positive environment of personal development, participation and training to improve competency and achieve Empowerment, Commitment and Accountability, as well as optimize the operating processes through the active use of cultural improvement methodologies. 5. We collaborate with other interested parties, required to achieve the best service and business outcomes. We ensure that this policy is communicated, understood, and accepted by our employees, to contribute to the achievement of the required commitments. (*)ISO 13485:2016, ISO 9001:2015, B-GMP RDC Nº 16, March 2013,Council Directive 93/42/EEC & 2007/47/ ECC Concerning Medical Devices, transition to new 2017/745 MDR and transposition to the national legacy documentation. WHY DO WE IMPLEMENT A QUALITY SYSTEM? The purpose of the Quality System is the need to demonstrate our capacity to consistently provide products and services that meet the requirements and expectations of our customers and to comply with the applicable rules and regulations that apply to our product portfolio. 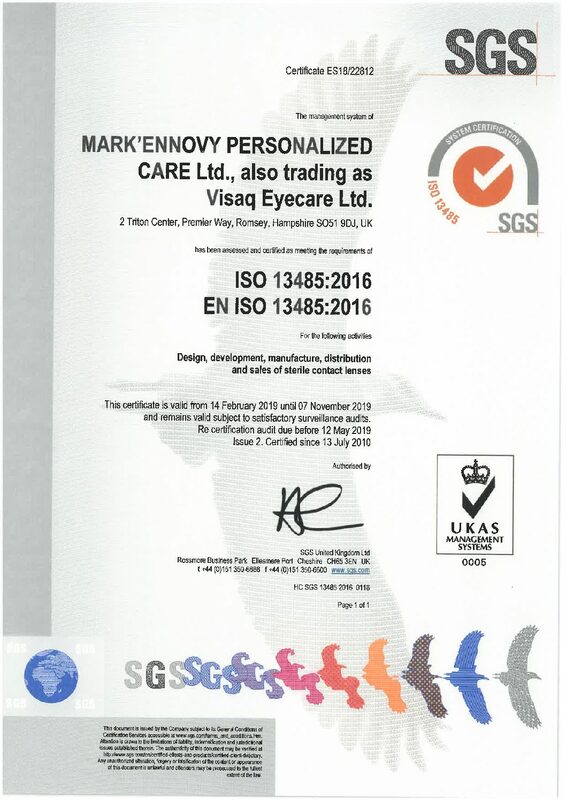 The Quality Management System is applied to all the activities carried out by mark’ennovy: design, manufacture and marketing of contact lenses. 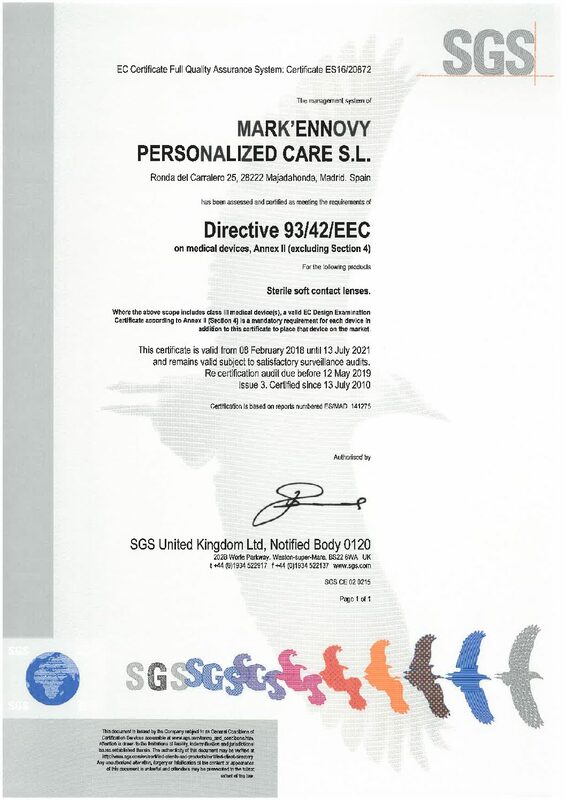 WHAT ARE THE QUALITY SYSTEMS IMPLEMENTED IN MARK’ENNOVY? This standard is related to medical devices and it specifies the system requirements for the quality management of an organization from the perspective of demonstrating its ability to meet the needs of its customers and the particular regulatory requirements for medical devices. HOW IS THE FUNCTIONING OF THE QUALITY MANAGEMENT SYSTEM MONITORED? The aspects that affect the quality of the final product or service are periodically measured by performance indicators. Any possible deviation or improvement opportunity is, then, translated into corrective and/or preventive actions. Documentation is regularly reviewed and updated according to changes in regulations, progress made and improvements introduced. Quality documentation comprises Quality Policy, Quality Objectives, Quality Manual, procedures, work instructions, quality records and all technical documentation. 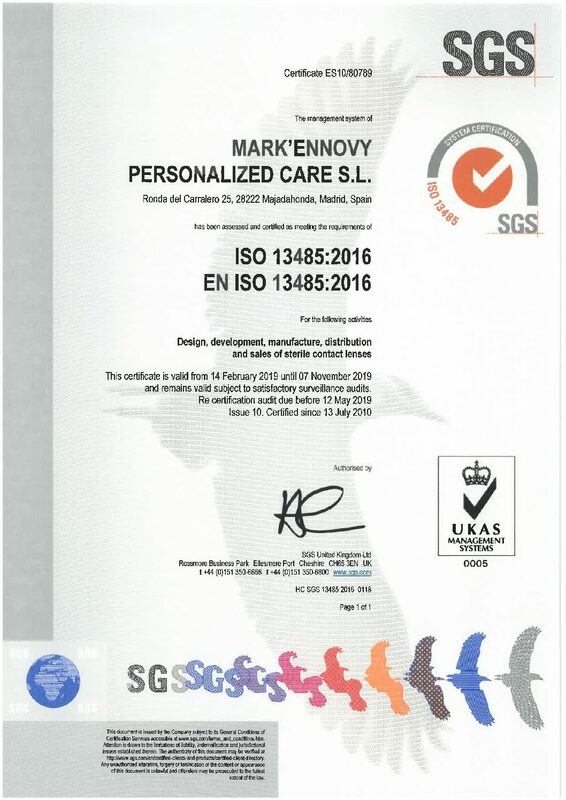 Annually, the Management Team of mark’ennovy carries out a thorough review of the performance of the Quality System, including the evaluation of internal and external audit results, complaints, non-conformities, Key Performance Indicators (KPI’s), quality objectives met (and setting of new objectives), corrective and preventive actions status, training programs, audits, risk management, market surveillance , legislative changes and improvement opportunities. This is to confirm that the Quality system continues to be effective and meets the needs of our business.